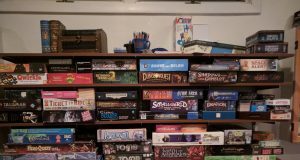 While my events for TotalCon are still in review, I figured assuming my games do go through I should probably think about what I need to run them. I re-read Bryson Springs and a couple things stood out: first, there are no pre-generated characters, so I’m going to have to make those up. Second, it very much fits the definition of “Old School” as presented in that episode of Fear of a Black Dragon I listened to on my way home from Carnage. Hmm, I’m surprised on writing that to see that I never commented on that podcast here in the blog, I guess I should do that, and what better way than to do so here while I’ve got a concrete example in front of me? In practical terms, making some characters is a pretty straight forward problem to solve. Bryson Springs gives a nice little section on possible hooks players might be given, on the assumption that the reader is going to let the players make their own characters. This is fine for a home game, but for a convention game I want to have pre-gens, so I started thinking about what would be cool. Interestingly, some of the hooks sounded a bit too specific to not be based on what actually happened during play testing. For example, one is “FBI agent(s) transporting a prisoner in a sensitive investigation and retasked with investigating… [spoiler redacted].” Now, FBI agents tasked with investigating a specific plot element in the game is very natural, but what’s all this about them transporting a prisoner? That piece sounds both really cool, and completely out of left field. As I’ve posted before, I have a system I like to use for character selection where the players are given only very limited information and a single physical prop for each character. So of course I’m thinking of what physical props I can create, both for my characters and the game at large, and I had a vague memory of seeing some pictures online of some another GM used for this very module. So off to the internet I went and searched for secondary info on this module. I found the prop pictures quite readily on imgur here. However, I also made another discovery – it seems the author of the module, Caleb Stokes, also created an actual play recording of him running it. Despite still trying to get through the end of the Warhammer Enemy Within podcast and being eager to start listening to more Fear of a Black Dragon podcasts, this piqued my curiosity enough to jump the queue and thus this morning I started listening to the Bryson Springs actual play while driving to work. And yes, he totally has a pair of players playing an FBI agent and a prisoner being transported. It’s funny how far I’ve come around on actual play recordings. I think the use of them as research into adventures I want to run has really been key for my enjoyment. At least that gets me over the hump of the first 20-30 minutes, which I think is how long it takes for one of these to grab hold and become interesting in its own right rather than just interesting in an academic way. That said, this recording in particular I’m finding invaluable to figuring out how to run Bryson Springs given the module’s very old school style of writing. Which brings us back to Fear of a Black Dragon. In the one episode of that I listened to the hosts spent a little time trying to pinpoint exactly what “old school” meant to them. I only have the one episode to go off of, but it sounds like they perhaps started the podcast simply with the idea of “let’s review old school style modules we really like” and only by this episode did they bother to think that maybe they should try to define that term out loud. It was perhaps one of the most interesting parts of the podcast, and triggered a discussion between Adam and I as we drove back home, which was quite a feat given how poorly I was feeling by that time. The thing that stuck with me most was the notion that old school modules (and here they include modern publications that are trying to ape that style) generally do not have endings. The hosts seemed to agree that an old school module, unlike regular fiction, is mostly beginning, possibly very little middle, and never any explicit end. It’s perhaps easy to jump from there to say they have “no plot”, but I think that’s not valid, and a good counter-point I’d highlight is Shadows Over Bogenhafen (which Fear of a Black Dragon reviewed and I’m now very eager to listen to that episode). There’s definitely plot in that module, but a lot of time is spent describing what the NPCs will do assuming the PCs don’t intervene, and then often some description of a few things the PCs might try and how to handle that. Always though is the implication that things might go totally differently and the text spends a lot of time trying to prepare the GM with enough background information to handle any contingency. The concept of old school being ending free is an interesting notion, and one I want to explore in more detail later. Adam challenged me to define whether my own horror games are “old school” or not, and I honestly had some trouble with that. It certainly wasn’t in my head to make them old school, but perhaps my inclinations point me in that direction without conscious thought. Anyway, I told myself I’d dig into that later, so let’s move on before this post becomes much too long. Bryson Springs is decidedly written in an “old school” style, according to the above definition. Most of the text centers around describing the important NPCs and locations, and the events that happened prior to the arrival of the PCs. In fact, there’s very little direction in here of where to even start, except in the gas station description it states that the owner Otis “is likely to be the first character many players meet.” Note, the gas station is the third location in this section, and this nugget comes in page 8 of 13. Listening to the podcast has definitely helped me figure out how one might run this, and much as I expected it’s a matter of considering the players and their motivations, and then putting them into the location that makes the most sense. For example, it makes perfect sense that the FBI agent might stop at the gas station as he drives across country. On the other hand, the reporter who was sent to investigate a murder stops first at the police station, though his player knew where the murder occured and could have just as easily gone there first. Much like Shadows over Bogenhafen, and for that matter most of The Enemy Within, a lot of time is spent describing NPCs, locations, and events to give the GM enough background to then find his own path through it at the table. Much like how I run D&D, it’s not about creating a story and then leading the players through it, it’s about having all the building blocks of a story at hand and creating it at the table with the players. In fact, I had to explain this concept to a player of my OED game recently. They were in town and I dropped three or four bits of info about what was going in town and the player asked “do you expect us to follow all these leads?” I had to explain that the players were free to follow any “lead” they wanted, and in fact I had little idea of where any of them might go. The point is to sprinkle details out like candy, find the one that excites the players to the point of them acting on it, and then grow that into the actual game. While I do think of my games as definitely story based, it’s all about emergent story, not premeditated story. The characters, I’m realizing, are a big part of this. For example, I’m wondering why Stokes didn’t include some pre-gens in the published game. Reading the raw text, one thing I wondered about was is there enough content in these scant 13 pages for a convention game? The actual play recording, however, is 6 hours long. The difference I think is the side plots the characters bring to the table. For example, if the players were a band of four FBI agents they’d tear through the material quickly, assuming they worked as a team to figure out the mystery. However, by making characters with very different goals we get whole scenes that have nothing to do with the written material, such as the gangster trying to break free from the car while the FBI agent is busy trying to arrest the interfering reporter (something both delightful and clearly totally unexpected by Stokes). I’m tempted to push this even further with my own pregens. I love the idea of the FBI agent and his prisoner. What if I also threw in a local sheriff who is assisting with the transport but is also on the take from the mob? Or maybe he’s a member of a rival mob family that wants to take out the prisoner before he gets to trial. I realized this is exactly what I do in my own games. The characters in Checkpoint Zulu, while generally aligned towards wanting to help East Germans escape, all have their own agendas and sometimes work a little against each other. Moments of tension, for example when the MI6 agent is exposed, are really fun and memorable, even if they have nothing to do with the actual plot of the rest of the game. So where does all this leave me? Well, once again I have a greater appreciation for actual play podcasts. Maybe I should consider making some for the content I’d like to print myself. It definitely feels like a pretty big value add, assuming that other GMs use actual play recordings the same way I do. Also I think I’ll definitely steal the FBI/prisoner concept for my own pregens. I kind of love the idea of giving the gangster a pair of hand-cuffs for his prop and then insisting that he wear them right from the opening. The other two characters so far are a little vanilla (I’m only an hour in to the 6 hour recording right now), so I’m not sure if I’ll steal them, and then of course I’d like to fill at least six seats so I’ll have to come up with at least two more characters of my own. The best news is that I’m actually now really excited to run this game. I think I made a good choice, despite it being made under duress. I love Bryson Springs, you’re in for a treat! I’ve played in it and run it, and every time has been a treat. Take a look at the location/clues flowchart, I found that quite helpful. Very nice discussion of the nature of “old school” design, too. Good luck on your con prep! Thanks Ethan, I do really like the writing and suspect it will be a fun one. Perhaps I’m missing something, but I don’t see any location/clue flowchart in my copy. There’s an NPC relationship chart, but that’s the only graph I’m seeing – everything else is pure text. When you ran it, do you recall roughly how long it took to play? My convention game must fit into a 4 hour slot, and I suspect it will fit comfortably in that time frame, but it’s always good to hear from someone that’s already run it.